As we move into the indulgent Holiday time of the year, all restrictions are off and imbibing is not only allowed, but encouraged. From mid-December on, while outdoors turns frosty, we surround ourselves with fire and warmth, appeasing pagan gods so they will return the sunshine to us, and attempting to keep our bodies and our spirits lively and expansive. If you are anything like me, your spirits expand to include after-dinner drinks such as Cognac, brandy and other grape-based distillates, dispensed in small but necessary portions after dinner. The French refer to these drinks as eaux-de-vie, which translates as the waters of life” implying these liquids are an essential element for living. Not a bad philosophy, especially during the coldest months. Whether you think of these distillations as digestifs, restoratives, or calming potions to be taken before bed, you might want to know a bit more about them, to be able to choose the most appropriate one for both your purse and your mood. Though there are local favourites everywhere, the following are the best-known French grape-based distilled drinks: Armagnac, brandy and Cognac. During the late Middle Ages, this wine was shipped to regions such as Britain and the Low Countries; areas that were too far North to produce their own wines. The wines suffered during transportation, so the Dutch brought their copper stills to Armagnac and Cognac in an effort to create a more stable product. Hence the name “brandy” which comes from the Dutch brandewijn, referring to “cooked” or “burnt” wine. If you’re not a Francophile, Armagnac is one of the more rare after-dinner drinks. In the US, it is practically a mystery. Consulting five reference books written by various British and American writers, I found five slightly differing versions of the production and regulation of Armagnac. This definitive information comes from the Bureau National Interprofessionnel de l’Armagnac:Traditionally, Armagnac was made in much the same way as Cognac. Or rather, the other way around, as Armagnac is considered the oldest spirit in France; up to 200 years older than Cognac. For both, the young wine, barely a few months old, is distilled during the first winter after harvest to not less than 40% alcohol by volume. In Armagnac, the process is done in a single distillation, where the copper still is exactingly regulated every step of the way; this must be completed by mid-February (some double-distillation may now be allowed in Armagnac, but it is just beginning). Strict laws govern all areas of production, storage and aging. 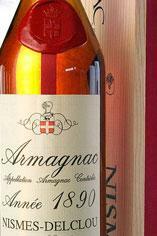 If blended, the age listed is for the youngest spirit used in the Armagnac or Cognac, dating from the year of harvest. Brandies from other regions of France and around the world can be made with different grapes according to each area’s regulations. Some of the French houses such as Remy and Germain-Robin have begun making excellent brandies in California. The Spanish have been upgrading and promoting a variety of brandies over the past five years, resulting in products definitely worth trying out. South Africa’s KWV brandies have been notably good, especially considering their extremely reasonable cost. Australia has wide range of prices and several nice, new, lighter-style brandies. When you go looking for your Holiday grape-based spirits, a good general guideline is that price and quality tend to rise together. And when you are pouring out the liquid for sipping, you have a choice of glassware. Napoléon, XO, Hors d’Age over 6-1/2 years old (but possibly much older). While nobody disputes the appeal of hand-warmed brandies sniffed and tasted from large, balloon-shaped glasses, the current fashion is for smaller, narrow glasses that can either be tulip-shaped or have slightly closed tops. Either way, sip slowly, and enjoy.